Mighty Moms is proud to partner with Similac and the Sister of Motherhood campaign dedicated to encouraging parents to move beyond judgments to focus on the strengths we each have in raising happy and healthy babies. They sponsored this post as part of that campaign. Expectations have been communicated to you that are as false as Kim Kardashian’s eyelashes. As your friend, it’s my solemn duty to strip away the lies and reveal the raw pulsing truth underneath. You sure? It’s going to rock things up a bit. There is no such thing as “balancing motherhood”. I spent a good hunk of my beginning mothering years trying to “achieve balance” and now, 13 years later I’ve decided that the whole thing is bull plop. Not only is it bull plop, but the world keeps trying to serve it up as some fillet mignon that I just haven’t seasoned correctly. It’s as if everyone else can cook up a balanced diet of motherhood like Gordon Ramsey, while I’m sitting there flipping crabby patties with a plastic spatula. Think back and consider your pre-kids days. How often did you berate yourself on your “lack of life balance”? I’m guessing not a lot. Finding balance wasn’t wasn’t too difficult. You needed to cook dinner. You did. Then cleaned it up within 30 minutes and watched a movie. You needed to prepare a presentation for work. You did. And rocked that meeting like Bono. It’s not that difficult to balance something when you’re sitting on both ends of the seesaw. But motherhood doesn’t put you on both ends of a seesaw. It puts you on NEITHER side of the seesaw, but running back and forth trying to be on both sides at once. That’s right, mama. Impossible. You need to cook dinner? Prepare to do it one-handed, making sure you fish out the teething toy before you pop it into the oven. You need to prepare a presentation for work? Plan on spending the 15 minutes prior trying to get the spit-up stain out of your jacket, before attempting to mentally shift at the last second and rock that meeting like Bono. The truth is we are all “winging it.” We are at the edge of our capabilities, trying to figure out how to get everything done. Being a mother is a lot less like playing on a seesaw, and a lot more like chasing a bowling ball all over the deck of a ship during a hurricane while wearing roller skates. Btw, foster mothers, adoptive mothers, grandmothers… doesn’t matter. If you’ve got kids depending on you, I’m talking to you. It’s your actions, not childbirth, that makes you a mother. We are all just one nasty diaper change from having to revamp our entire afternoon. How do you balance that? You can’t. You can just flow with it. Instead, I should seek to find joy and contentment in the life stage I’m swimming through. It’s time to lower my expectations for myself, my kids, and the other moms around me. I need to turn those little frustrations around and actively search for the silver linings I can use to glue a “good day” together. The goal shouldn’t be to “balance” the life I’m living. The goal should be to just stay on the boat. I’m going to be rocked all over the place, but if I can keep myself (and my kids) from spilling over-board, well, that’s a win. You know the part at the end of the video when the stranger-moms lock eyes across the parking lot and smile? That’s me and you, friend. We get it. It’s amazing how simple things, like seeing a mom taking the trash out with a baby, or walking her baby in the living room at 2 am wearing pants that we know she would NEVER wear in public (I have a pair like that too!) can build us up. It’s like a giant thunderclap of “I’m not the only one!” That’s what the Sisterhood of Motherhood is all about. It’s what Mighty Moms is all about. Breaking down the false walls of motherhood and embracing what is true, wonderful, and above all, real, about motherhood. I want more moms to feel the shackles of judgment (of yourself and of others) removed. I want you to no longer feel the pressure that comes with “finding the balance”. Let’s encourage each other by removing the stigma of “balancing motherhood”. Your child is much more complex than a piece of wood on a pivot. Why should we expect that caring for him, for yourself, for your home, for everything would be that simple? Share this heartwarming video with your mom-friends. Then let those heavy shoulder pads of “I’ve got to balance all this” fall away. You are enough for today’s tasks. And tomorrow you’ll be enough for tomorrow. It won’t be perfect, but that’s okay. Your child doesn’t need perfect. He needs warm arms, a safe home, and healthy food. Everything else is gravy. You can do this. Find peace in the chaos. Search out that joy in the junk. You just need a little Sisterhood to remind you how normal this all really is! No More Judging in the Mom-Space. 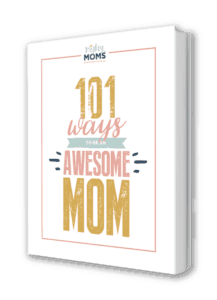 Having a Bad Mom-Day? Read This. Similac partnered with influencers such as me as part of its Sisterhood of Motherhood program to promote Its Pro-Advance and Pro-Sensitive products. As part of this Program, I received compensation for my time. Similac believes that consumers and influencers are free to form their own opinions and share them in their own words. Similac policies align with WOMMA Ethics Code, Federal Trade Commission (FTC) guidelines and social media engagement recommendations.